Precisely chosen words juxtapose the atmosphere of nature’s bounty and fun exploration. The epic illustrations seem to jump of the page at you, asking you if they really are mere pictures or if you are experiencing the story yourself. 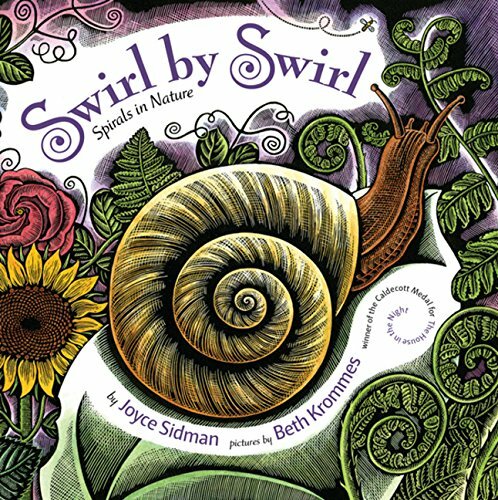 With high credentials to match their high talents, author Joyce Sidman and illustrator Beth Krommes create a book that is simply a work of art, prompting readers to go into nature and experience swirls and their gorgeousness as they appear in real life. Who could sum up the book overall better than the author herself: “A (spiral) is a clever shape. It is graceful and strong. It is bold . . . and beautiful.” Truly, Swirl by Swirl is all these things—if not more. This book should be categorized in a genre that encompasses not only the audience it addresses, but how the audience responds while reading it. If that were possible, this reviewer would put it in the following category: Oh my goodness! This is beautiful! Nature is amazing! What a flawless book! Get the idea? Go out this instant and purchase Swirl by Swirl: Spirals in Nature by Joyce Sidman. You and your children will never again face boredom while reading this gorgeous and illuminating picture book. V. S. is a pseudonym for the essay contest winner of the American Legion of Westchester County, 2009. A contributing author in the Anthology of Poetry by Young Americans, 2008 Edition, V. S. is 13 years old.